We know little of the language and nothing of the food. It’s all different food in the grocery stores, restaurants and street vendors. The only thing that looks the same are bakery items. I kno﻿w some things are seafood, but what. I do not know. Some fruits and vegetables that are not wrapped up are recognizable. Almost everything on the shelf in the grocery store is in a plastic container, sealed plastic bag, or vacuum wrapped. The big drawback, no english on the package, so you do not know what is inside. What is really handy are that the convenient stores sell pre made meals in plastic containers that they heat up in a microwave for you. 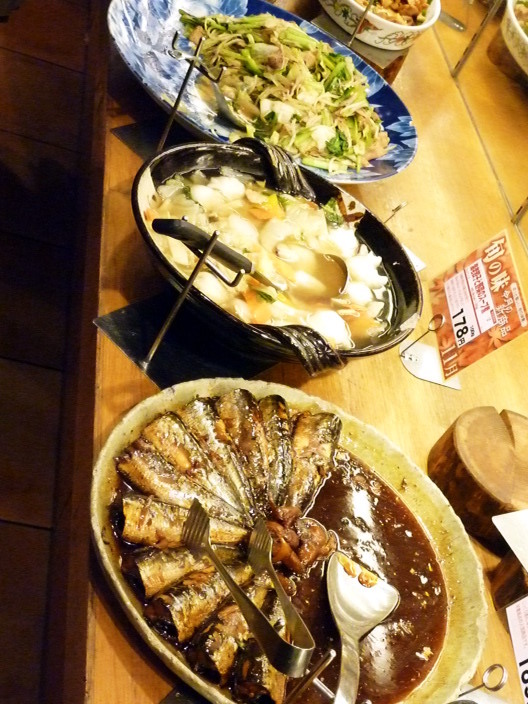 Almost all of them are some variation of rice or noodles mixed with fishes or meat and a concoction of vegetables. 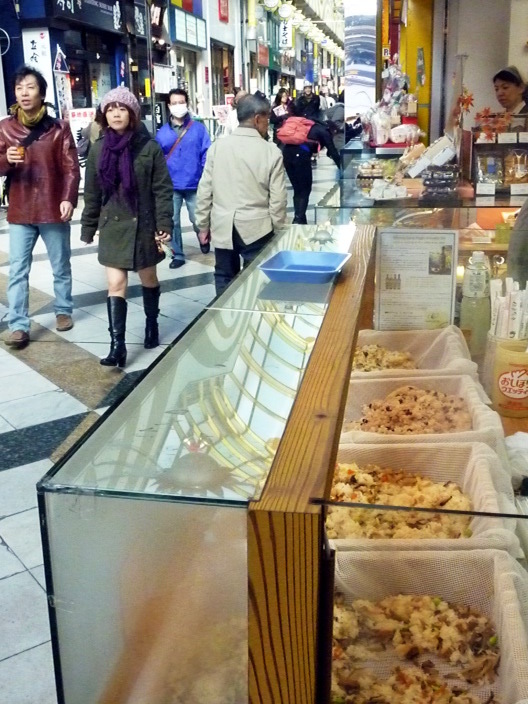 The takeout buffets are excellent too, because you can see the food and take a good guess at what it is. 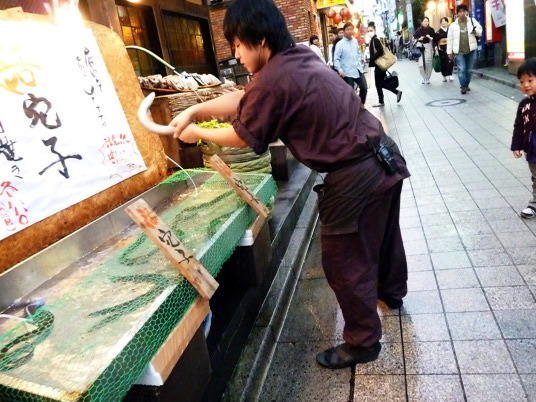 A restaurant employee replaces an eel that jumped out onto the sidewalk and squirmed around in and out of the hands of 3 employees before one of them caught it. Quite a crowd formed for the show. You can buy different rice concoctions on the alleyways. The rice balls are really good. Different rice mixtures wrapped in a sea weed paper-like wrapping. 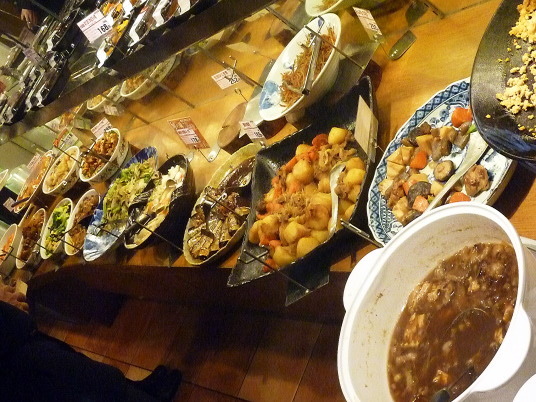 The takeout buffets are good because you can take a good guess at what you will be getting. Usually some seafood, vegetables, and sauce. What kind of each is only a guess.